Lemon curd is silky smooth, tart and sweet at the same time, and goes so well with scones. It can be fairly pricey in the market, especially if it’s made with real, wholesome ingredients. 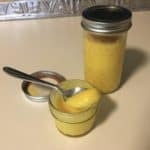 Luckily, homemade lemon curd is incredibly easy to make, using just 4 ingredients: egg yolks, sugar, butter, and lemons. Some recipes call for using whole eggs, but I recently found a recipe that just uses the yolks and it turned out the beautifully lemon yellow color found in commercially produced curd. I also happened to have egg yolks leftover from a chocolate satin mousse I had made for Passover (that’s a story for another time), so that’s the method I chose. Whisk the egg yolks and sugar in a heavy bottomed saucepan. Set on low to medium heat (I set it on 4 out of 10 where 10 is the hottest temperature). Add the butter and heat slowly until the butter melts. Add the lemon zest to the egg yolk mixture. Once the butter has melted, add the lemon juice. Stir using the whisk or a spoon (egg yolks are more forgiving than if you use whole eggs). Stir the mixture as it thickens (about 15 minutes). Remove pan from the heat, put the lid on it and let it thicken from there. When cool, placed in sterilized jars. Keep in refrigerator. After it’s been cooled, lemon curd is quite adaptable. Served next to scones or toast, it’s a wonderful spread on its own. But you can use it to fill tart shells or mix it with unsweetened whipped cream for a quick lemon mousse. Use it in trifle or parfaits. Fingerpaint with the kids…have fun with it! You can use this same homemade lemon curd method using different citrus…limes (regular or key lime), Meyer lemons, oranges, grapefruits, etc. Each will give you another flavor to play with. I gave you the recipe for making scones in Time for Tea, so now you have the knowledge you need to go forth and have something to serve with your tea. Remember, if life gives you lemons…make Lemon Curd!